With the temperatures rising, Collective Media Magic has gathered everything you need to look cool and collected this summer! 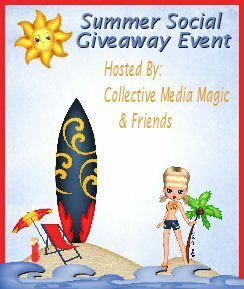 Summer Social Grand Prize Giveaway Event. professional hair tools from GKhair! and the Age Repair Trio set! A $50 gift card to SwimSpot. This giveaway is open to residents of US, 18+ and will end on Tuesday, July 3, 2012 at 12:01am EST. The winner will be selected randomly from all eligible entries and will be notified by email Winner will have 48 hours to respond before we must move onto a runner up. Facebook, Pinterest and Google+ are not responsible for nor involved in this giveaway in any fashion. Sponsor are responsible for supplying the prizes and shipping prizes to the winners. I have received products to explore for the purposes of creating feature reviews in conjunction with this giveaway event. What is on your Hot List for Summer 2012? The Aristocrat is my favorite style of dress! My favorite dress is Walk the Plank. The serenade is my favorite. The Elizabeth Islands dress is my favorite! Love the Overboard with blue and one stripes. I am in love with the red queen dress! The G. Cooper is my favorite dress. I like the Black Beauty Mark dress. Sixteen Candles dress is a favorite. My favorite is Vineyard Sounds. I love the ahola dress! I like the admiral dress. The "Heart of Me" shirtdress is making me swoon! I love the San Gabriel dress. The Alice dress is on my list. The headliner dress is cute and classy! I like the V.P. from the skyscraper collection! I love the Red Queen lace dress! My favorite is the Black Beauty Mark dress. The Aloha is one of my favorite dresses of theirs. My favorite is the G. Cooper Dress. I like the One For My Baby dress. My favorite is the Bianca. :-) Thank you. Billie coctail dress. Thanks for he giveaway. I like the Beachcomber Shabby Apple dress. I love the Blue Eyes dress!! Classic and sophisticated...but fun and flirty! I like the black Aristocrat dress. I most like the black Beauty Mark dress!